If you’re looking for a rooftop grease containment in Denver, you’ve found your providers. The accumulation of grease is a major fire hazard. What many restaurant owners may not know, is that it can also result in the caving in of your roof. Restaurants that do a lot of frying are required to have a kitchen hood system. A kitchen hood system prevents smoke and grease from accumulating in the restaurant and running your customers out the door. When smoke and grease come into contact with each other, and the grease becomes hot enough, it can ignite. This is a grease fire. And grease fires are no fun. Talk to any fire fighter who has ever dealt with one, and they will tell you it was particularly difficult. Grease turns to liquid when it is hot, and therefore splashes easily. This causes the fire to spread quickly and often times become out of control. So, you’re wondering what this has to do with the caving in of your roof? Well, if you have a hood system, you’re getting most of the grease out of the restaurant as planned. But it has to go somewhere. That would be your roof. If you do not have a rooftop grease containment, the grease is sitting on your roof and your roof is likely in early stages of corrosion. Grease is destructive, man. SO IF YOU LIKE YOUR ROOF, WE SUGGEST INSTALLING A ROOFTOP GREASE CONTAINMENT. 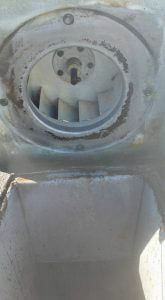 The best way to save your roof is by installing a rooftop grease containment on all of your exhaust fans. This prevents the grease from accumulating on the roof. 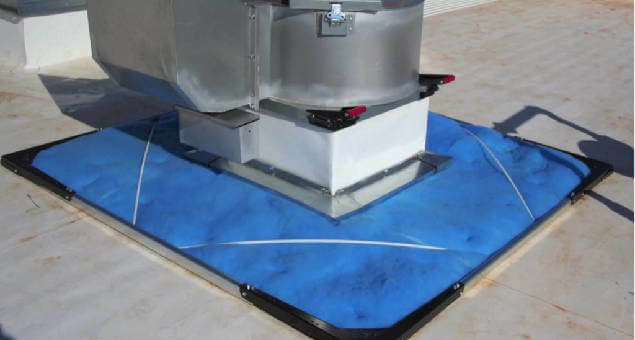 An effective rooftop grease containment will provide hydrophobic pads, which are designed to shed water and hold onto grease. This way, you won’t have to worry about the rain water accumulating and causing the grease to spill over. If you only have a grease box, the rain water will just add to the volume of the grease and it will eventually spill out onto the roof. ProCo Hood Cleaning will provide you with an adequate system for your business. It’s not like you can go down to the dollar store and grab one of these. Local health codes require that you have your rooftop grease containment professionally installed so that you can ensure it is done properly and safely. Call ProCo Hood Cleaning today so that we can have a look at your current rooftop grease containment system. We will determine the best route to go from there. ALREADY HAVE A ROOFTOP GREASE CONTAINMENT? IS IT UP TO CODE? If you already have a rooftop containment system, but need a cleaning or maintenance, we can take care of that. We are professional restaurant equipment cleaners and cleaning rooftop grease containment just so happen to be one of our many talents. Your local board of health will likely require that you have a rooftop grease containment, and they also require that it is professionally maintained and cleaned. Whatever you do, don’t ever venture onto your rooftop and start poking around your grease containment system. If you’re not educated in the system or you are not aware of your roof’s current condition, this could be dangerous. Always call a professional. We will always keep you in the loop on what we’re doing up there and what our findings are. When we perform a rooftop grease containment cleaning, we will always ensure that it meets the local code. YOU CAN ALWAYS COUNT ON US TO GET THINGS DONE THE RIGHT WAY. We know it can be nerve-racking to call a stranger to your location. You probably wonder if they are going to be nice, awkward or super weird. Well, you can count on one thing with ProCo Hood Cleaning. We will always treat you, your employees, your customers, and your clientele with respect and professionalism. Businesses like you are what keep businesses like ours going. You make it possible for us to live our lives and do what we love. We are passionate about helping restaurants and commercial kitchens really “shine”. When we do business together, we plan on building a relationship with you. We want you to feel comfortable calling us any time for our help. Call us today. Let’s do business.